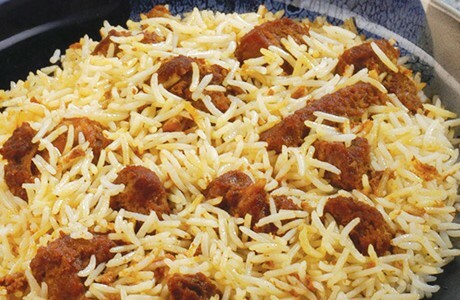 The light, fluffy basmati rice pairs perfectly with the delicious meat and authentic spices. This dish is full of tender lamb blended with fragrant almonds, poppy and coriander seeds, and chili powder. Mix the lamb with the ground paste. Heat the oil in a deep pan; add the onions and sauté till light brown. Add the lamb and mix well. Reduce heat and add yoghurt. Continue to cook until the yoghurt is absorbed and the lamb is brown in colour Add just enough water so that very little remains when the lamb is almost tender and the oil rises to the surface. Remove the pan from the heat. Keep aside. Bring 3½ cups water to the boil and then add the drained rice and salt, Stir to mix well. Bring back to the boil; reduce heat, cover and cook until the water is absorbed and the rice is almost done. Grease a deep ovenproof pan. Layer the rice and lamb, beginning and ending with the rice. Spread a slightly moist cloth on the rice and cover with a tight-fitting lid. Put the pan in a preheated oven (I70°C / 325°F) for 10-15 minutes.